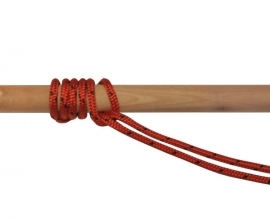 Sailmaker’s Whipping is an easy way the whip the ends of laid rope that doesn’t require a needle or palm. Loops are used to “embrace” and hold down each strand, making it a very secure way of whipping. 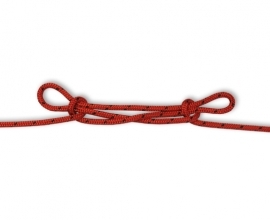 When tied carefully, this type of whipping will not slide or come undone even though it’s not stitched to the rope. 1. Unlay the end of your rope to reveal the three individual strands. Create a loop in the end of your whipping twine and pass it over one of the strands. Leave the loop free on the other side of the rope and leave a short tail on your whipping twine. 2. Hold the tail and longer working end of your twine together to keep the loop in place and relay the rope. 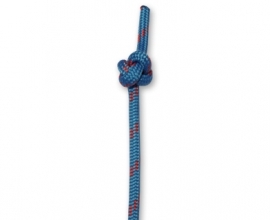 When the rope is relayed, use the long working end of your twine to make a round turn around the rope. 3. Keep making round turns (whipping turns) toward the end of your rope until your whipping is at least 1½ times as long as the rope is wide. 4. Take your loop and bring it to the end of the rope. Pass it back over the strand the two ends of your twine lay between. 5. Pull firmly on the short tail of your twine to lock your whipping in place. Take the tail and bring it towards the end of the rope, following the groove it comes out of. 6. Take the tail and the working end of the whipping twine and bring them together in the center of the rope, between the three strands. 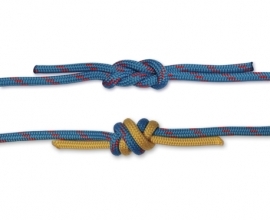 Tie a Reef Knot in your twine to secure the whipping in place. 7. Finish off your whipping by trimming off the excess rope. What kind of rope is the red one?